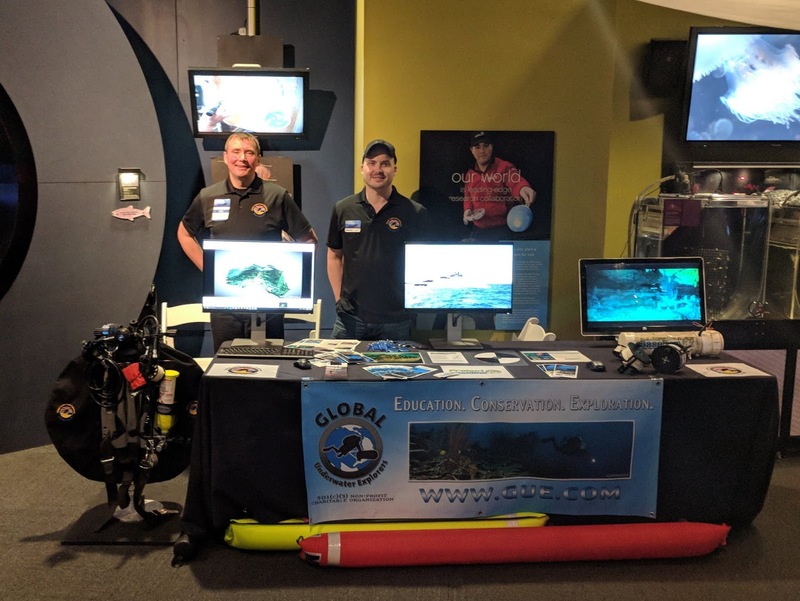 For the third year in a row, GUE-BC attended Diver's weekend at the Vancouver Aquarium. Next year with be its 20th anniversary! 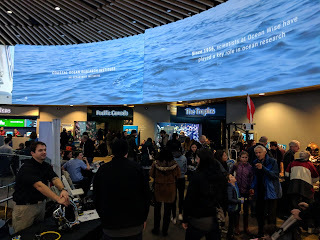 Notable folks in attendance were: Sea Dragon Charters, Nanaimo Dive Outfitters, Rendezvous Dive Adventures, Liz Tribe Diving, the Dive Industry Association of BC, the Alberta Underwater Council, and the Marine Life Sanctuaries Society. Hamish Tweed had a table promoting his work with Glen Dennison on the health of the glass sponge reefs in Howe Sound. It was pretty busy! A big thank you goes to GUE Headquarters for material and swag. GUE-BC got the same location we had last year by the jellyfish tank. It was perfect, a big thank you to Jeremy Heywood for that! On booth duty, we had myself, Dennis Diamond, Vladimir Chernavsky, Nick Bowman, Michael Shapiro, Evan Soukas and John Campbell. Thank you for helping represent GUE so well! Unfortunately we didn't get a large group picture this time. The theme of the year was dive training. The Aquarium lined up several people to speak on that theme. Liz Tribe came over and did a talk about GUE. Our booth got quite a bit of interest after that. We did a lot of talking about photogrammetry. The usefulness of it as a tool for citizen science was quite apparent. The 3D models Jo Hjelm made of Nomash River cave really generated interest. Nick Bowman talked to Hamish Tweed about the possibility of some joint information sharing and diving on the Howe Sound sponges. 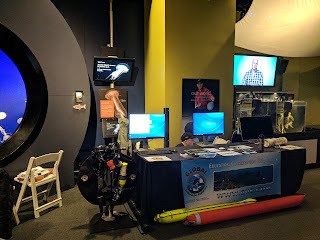 Jessica Schultz of the Aquarium team came over and talked to us about photogrammetry as well. The GUE Photogrammetry course will have no shortage of interest! The Alberta Underwater Council spent a good deal of time talking to show attendees. There would be a show called Divescapes on October 12-21 in Edmonton, and they were looking for people interested in attending. A lot of people were fascinated by Nomash Rive cave. This year's upcoming GUE-BC event to visit it on Aug 18 - 24, 2018 will generate a lot of new material to show people. The photos by Joakim Hjelm made all the difference, along with the interactive photogrammetry models. This was definitely something to keep and expand for next year. GUE-BC had a meaningful conversation with the Marine Life Sanctuaries Society, and we hoped to re-kindle joint efforts between the two groups. Another conversation was had with the DIABC, and it might be possible for the newly incorporated and insured GUE-BC to join that organization. Lots of opportunities! To me, what made the weekend was being re-visited by a young and passionate conservationist who had so impressed me last year. She had moved on from her conservation web site project, but was still looking for ways to make a difference. It was repeat interactions like this that made it so important for us to keep attending events like this regularly. Thank you very much to everyone who participated in Divers’ Weekend 2018. The event was a resounding success - over the weekend we had over 6000 visitors through the doors. 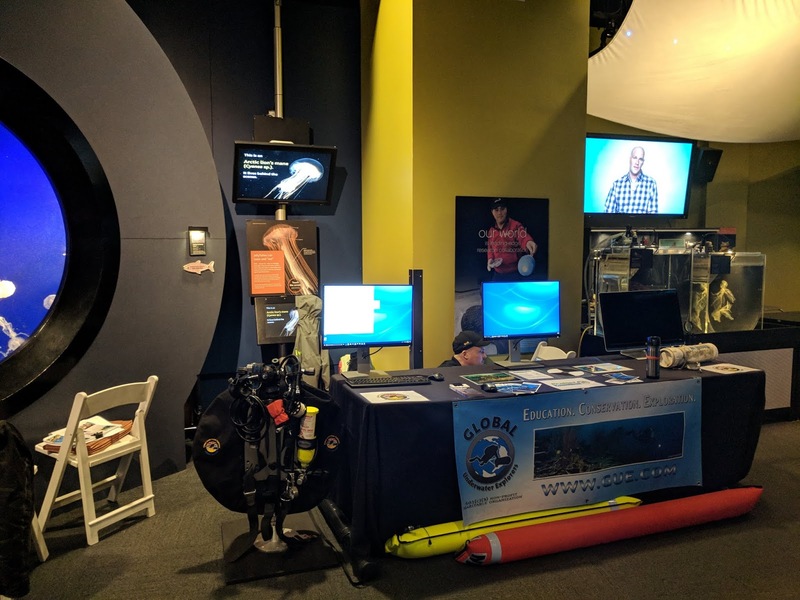 The 32 exhibits looked great, and visitors and staff alike enjoyed the demonstration dives by the Heritage Hard Hat divers and the Canadian Coast Guard. Thanks to those teams for their efforts – these dives were a highlight of the weekend for me. The Workshop Series was a great success as well – it was standing-room only in most sessions. Thanks to Stu Sy, Jessica Schultz, Kelly Korol, Lee Newman and Liz Tribe for their presentations.